The model ‘FC’ Gate Valve is a field-proven valve which provides reliability and interchangeability. The ‘FC’ valves has bi-directional sealing and a non-rising stem making it ideally suited for drilling Manifolds, X-mas trees and severe service. The Stem pin protects the stem and internal parts from failure by shearing if the handwheel is over-torqued. One piece gate helps to prevent line sediment from entering the body cavity and prevents pressure locks when the upstream pressure drops. Easily equipped with Hydraulic Actuators for Manifold or Subsea service. * 15,000 PSI Req. 2 Parts, 1 Packing, 1 Ring. ** Not Used on F Type. ** Not Used on ‘F’ Type. * 15,000 PSI Req. 2 Parts, 1 Packing, 1 Ring. ** Not Used on ‘F’ Type. ** 15,000 PSI Req. 2 Parts, 1 Packing, 1 Ring. For parts not listed on the parts list, send description of the part or part number as well as trim request. 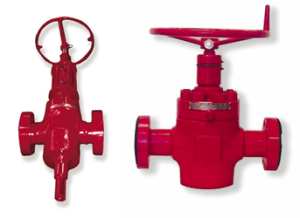 * Recommended spare parts Parts for 7-1/16″ gate valves available on request. Parts change for Arctic service and/or H2S service. † Use 12 bonnet bolts for 4 1/16” 10,000 psi valve. ** Body uses standard trim part for this service. †† Do not use normal temperature body for Arctic service. Item No. Description Qty Req No. Spare Parts Rec.